In order to make real use of IP CCTV systems, Saten establish strong relationship with Digifort Platform, so our clients will get CCTV solutions for any enterprise, from small projects to management of cities surveillance systems. Established in 2002, Digifort is a software for “IP Surveillance” and digital image storage. Known as VMS, Video Management Software, the product carries advanced resources, equipment and technological solutions for the segments of digital intelligence, corporate surveillance and urban security. 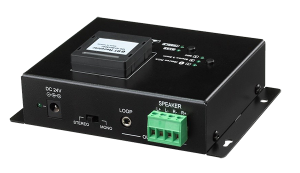 60W RMS left and right channel digital amplifier extra supporting microphone broadcasting is ideal for being used in classroom, conference or SOHO room. The devices is designed to enhance sound reinforcement through audio input connectors either wired or wireless- Bluetooth®. Additionally, supporting access control over IR extension through the provided IR receiver using the customized remote control is also an additional feature.